So begins a new rendition by Lee Stetson, the veteran actor who’s brought Muir to life on stage since 1983 with his first production, “Conservation with a Tramp.” That show depicting Muir in the sunset of his life reflecting on his many adventures and his battle to preserve Hetch Hetchy has captivated hundreds of thousands of people in Yosemite and elsewhere. In his new act, “John Muir is back, and boy, is he ticked off!” Stetson portrays a modern-day Muir who’s angry and yet sometimes humorous as he rails against environmental destruction of the modern day. Speaking in a thick Scottish accent from behind a distinguished natural beard that would do Muir proud, Stetson drew a laugh from his audience when he expressed Muir’s likely response to his many California namesakes. 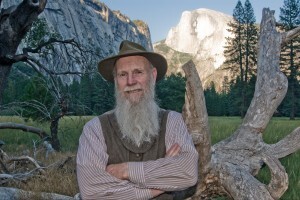 While the performances are drawn almost entirely from Muir’s own writings, Stetson admits taking a greater liberty with the material in his new presentation. But then, who’s more qualified to speak in Muir’s voice than the actor who’s portrayed him for 26 years? Stetson even edited “The Wild Muir,” a popular book of the environmentalist’s writings about his more hair-raising outdoor escapades. A native of Maine, Stetson graduated from the University of Hawaii and fell in love with the wild country that remains among the islands. While an “armchair environmentalist,” he pursued acting, writing and directing in Hawaii and California. Then a friend gave him a biography of Muir that would change his life. Stetson spent months producing the script for “Conversation with a Tramp.” Large and enthusiastic crowds greeted the show in Yosemite Valley. Stetson has continued performing his original creation though he has introduced variations over the years, like “John Muir among the Animals,” “The Spirit of John Muir,” and “The Tramp and the Roughrider,” about Muir’s Yosemite meeting with President Teddy Roosevelt. “It’s been a long and happy road for me,” said Stetson. “I’ve been all over the country, and even out the country on occasion, to deliver the message. For the most part, I’m preaching to the saved. The environmental groups that want my services are already committed to the message. But I think the saved need to hear it often too, and they do. Among Stetson’s other interests: chess, reading, hiking, and enjoying the company of his wife, Connie. A resident of Midpines, he served a term on the Mariposa County Board of Supervisors. Promoting Muir’s ideals through his performances, however, is a full-time job that fills his calendar annually. He plays several shows a week during summer months in Yosemite Theatre behind the main visitor center. “As long as there’s a demand for it and I can still walk, I’ll be up there,” he promised. For more information about Stetson’s performances, visit www.johnmuirlive.com.